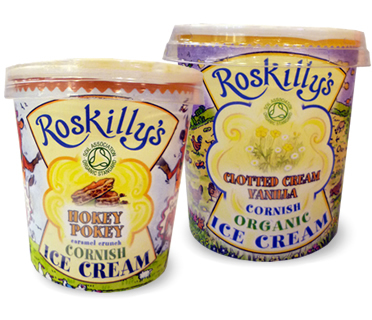 Roskillys - A working, organic Cornish Farm. For me a trip to Roskillys farm has a similar effect as the herb Catnip has on cat, but in an ice cream, fudge and jam kind of, human way. Im drawn to the lure of those beautiful Jersey cows with their long eye lashes and the delicious products that the Roskilly family make from the organic milk produced by their 100 strong herd. Located about 2 miles outside of Coverack on the Lizard Peninsula, Roskillys Farm is a must do if ever you find yourself down this way. Think Charlie meeting Willy Wonker, or a pilgrim going to Mecca, its the home of probably the best ice cream in the world and a complete range of fudge and preserves too. The Roskillys are an incredibly arty family and this talent reflects in everything about the farm which gives it a stylish rustic charm that makes it a completely unique setting. As you enter the shop and Croust House you are immediately hit by the beauty of the interiors which provide a showcase for the furniture and the fused stained glass also made on the farm. These items and work from other local artists are on display in The Bullpen Gallery where you can loose yourself in the creative talent that arises from too many stormy seas and such like. Kids can be kids and play on the antique Massey Ferguson and pisky trails are the norm on high days and holidays. In the summer evenings there is nothing better than one of their barbecue meals followed by a peek at the Romany Caravans and a boo and see you under the giant Gunnera plants (or Cornish Triffids as we call them). Avoid open toed shoes if you plan on visiting the cows, not because they are big and heavy but because of that cow called Pat. Behind the scenes, Roskillys is one of the largest employers on The Lizard providing jobs for 60 people during the busy periods and 30 during the winter months. This is a serious business supplying produce to as far north as Dundee or to a sofa near you courtesy of their web site at www.roskillys.co.uk. There is something for everyone at Roskillys be it the whiff of real cows being milked, the sight of ice cream being made or simply the pleasure of good food in a beautiful quirky environment. Best served when you are completely chilled.